Care2 Causes | Top 10 Most Hated Foods in the U.S.
Top 10 Most Hated Foods in the U.S.
What’s your least favorite food? Personally, I loathe the texture of bananas, the taste of calamari, and the smell of roast beef pervading the kitchen. Yes, we all have personal preferences when it comes to food. 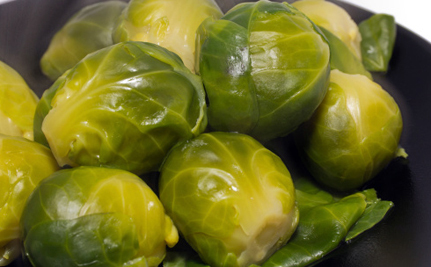 I happen to love Brussels sprouts, possibly because I grew up with eating them at least once a week. My husband, by contrast, hates their texture, their flavor and their smell, which he says reminds him of smelly feet. However, it should be noted that these vegetables are very high in fiber and protein. Scientists also say the vegetable may protect against cancer because it’s rich in indole, a phytochemical, and vitamin C.
Ah, garlic, guaranteed to ward off evil spirits; it may also ward off all of your friends! Garlic has been used for thousands of years. Sanskrit records show its medicinal use about 5,000 years ago, and it has been part of Chinese medicine for at least 3,000 years. The Egyptians, Babylonians, Greeks and Romans used garlic for both culinary purposes and for its therapeutic benefits. Closely related to the onion, rakkyo, chive, leek and shallot, garlic is of course a herb used widely as a flavoring in cooking. According to Kitchen Daily, this is the third most despised food in the U.S. Fondue was an extremely popular dish in London, when I was living there in the 80s, and is still favored in Switzerland. Still, it must be said that cheese fondue is a sad, gloppy mess at best, and an extreme example of dairy abuse at worst. Tofu, with its strange texture, is understandably up there on the most-hated list. Tofu is made from soybeans, water and a curdling agent. High in protein and calcium, it has been a staple of Asian cuisines for hundreds of years, and has recently become popular in Western vegetarian cooking. But it still has that weird texture. I’m not sure what’s so much to hate about celery, except that it is so boring. You know, it has almost no taste, and it mostly seems like an exercise in chewing. So, what’s the point? Easy to see why it ranks number 5 on the most hated foods list. Oysters are just plain disgusting. Not only can they still be alive when swallowed, rumor has it that they can stay alive for two minutes after being swallowed. The word oyster is used as a common name for a number of distinct groups of bivalve molluscs that live in marine or brackish habitats. Some of these, cooked or raw, are consumed by humans and considered a delicacy. Others, such as pearl oysters, are harvested for the pearl produced within the mantle. Living in France several years ago, I was encouraged to make my own mayonnaise, with raw egg yolks and olive oil, beaten together in just the right way. I threw away over a dozen eggs and much olive oil before I finally gave up. In any case, the manufactured mayonnaise that is produced in the U.S. is vastly different from its French counterpart. President Obama certainly doesn’t care for it, and Jimmy Fallon thinks it looks like pus. I happen to love mushrooms, although I did just find out that infestation by up to 20 maggots per 3.5 ounces is considered acceptable for commercial sale of these vegetables. Some people don’t like them for their texture, others for their smell, but the reality is that mushrooms are used extensively in cooking, in many cuisines, notably Chinese, Korean, European and Japanese. Most mushrooms sold in supermarkets have been commercially grown on mushroom farms. Licorice is one of those tastes that you either love or hate. It turns out that if you are one of the latter, you are right to be wary, especially of black licorice. The Food and Drug Administration (FDA) warns that black licorice contains the compound glycyrrhizin, which is the sweetening compound derived from licorice root. Glycyrrhizin can cause potassium levels in the body to fall. When that happens, some people experience abnormal heart rhythms, as well as high blood pressure, edema, lethargy and congestive heart failure. Number ten on the list is cilantro, a herb with wide delicate green leaves and a pungent flavor. The seed of the cilantro plant is known as coriander, and its flavor is entirely different from cilantro; the two cannot be substituted for each other. Just to be even more confusing, culantro is a different herb again, although related to cilantro. It is widely used in dishes throughout the Caribbean, Latin America and the Far East. The fact that some people are genetically predisposed to hating cilantro would explain why this herb made it on this list. I, for one, think cilantro has a fantastic flavor. Which foods do you hate most? Thanks for sharing. I have to agree with #s 4 and 6. Brussels sprouts and tofu!!!!!!!! Eeeeeeewwwww!!! !